This is your chance to see the Beeline Britain team on stage and on screen as we share our record-breaking journey to raise event more funds for BLESMA. In May 2014, the Beeline Britain team set out on a journey which had never before been attempted. Their intended route, travelling in a straight line from Land’s End to John O’Groats comprised the UK’s largest open sea kayak crossing, its second highest mountain and its third largest city. Meet the team of four which included a retired RAF Helicopter Crewman, retired Army Captain and Team GB Paralympian, a professional kayak coach and the first Welsh woman to climb Mount Everest. The team kayaked, cycled and hiked their way through some of the UK’s most extreme rural and urban environments, covering 1,100km and setting two record-breaking sea kayak crossings on route. Their journey was captured on camera by Image Impossible and has been made into a poetic documentary with incredible cinematography. Its producer Ian Burton has worked in the film industry for almost 20 years as an adventure camera man and producer specialising in remote locations and expeditions. He has shot several award-winning films for television and the big screen including the BBC2 Series Climbing Great Buildings (2010) and Snowdonia (2011) for BBC Natural History Unit. 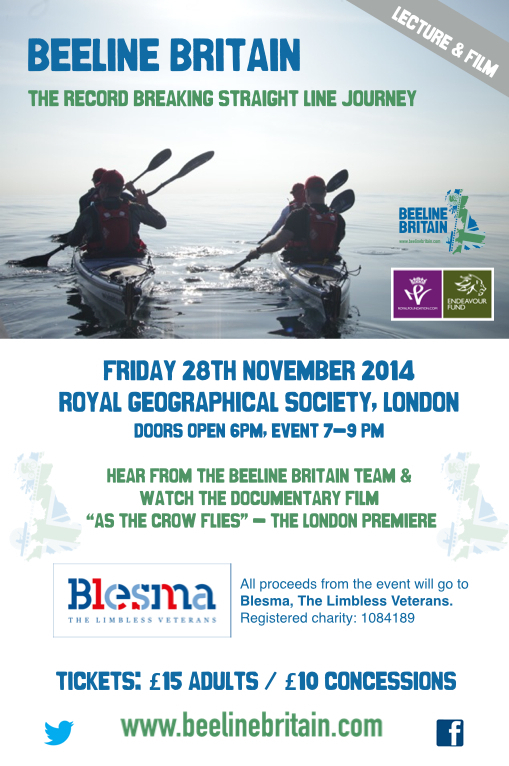 “As the Crow Flies” captures Beeline Britain’s 28-day record-breaking journey like no other adventure film. The ruthless simplicity of a straight-line has been transformed into 60 minutes of beauty, raw emotion and passion that will inspire and entertain you. Beeline Britain was supported by the Endeavour Fund which was created by The Royal Foundation of The Duke and Duchess of Cambridge and Prince Harry to support sporting and adventurous challenges conducted by wounded, injured or sick service personnel and veterans. All proceeds from this event will go to the teams chosen charity Blesma, The Limbless Veterans.